Since 2010, when Prague Thrift Store was established - we are here to help the community - making the earth a better and livable place for everyone. Supporting Prague’s community with good quality resale items at affordable prices. Providing and allocating volunteers areas in need. As a family-run organization, bettering our community is very important, not just to us, but to our donors and customers as well. Thomas Szende, a Budapest-born management consultant moved to the Czech Republic in 2005 where, along with his wife, he founded the Prague Thrift Store. When we met up to talk about his successful endeavour, I noted that the stores are charity-oriented, which is quite a rare thing to see in the Czech Republic. "I think that in post-communist countries, charity stores are not as common as in Western European countries or in the United States." The obvious reason would be because under the communist system it was all centralised and so there was no charity. It was all through the state. Tell us about the beginnings of the store idea. "Before I moved to the Czech Republic, I lived in the US. My company had sent me there, and that is where I met Barbara. They then sent me to the Czech Republic and when we moved here, that is when we got married. And Barbara loved charity stores, and thrift stores in particular because she lived in the US. And when we moved here, we had a great number of surplus items, because when you combine two households, you pretty much have two of everything. And eight years ago, she set about trying to donate some of these items. It was at a time when even textile donation boxes on the street were very rare. So it was really a problem for people to donate their possessions. Barbara tried to call up charities, but no-one spoke English. Some even slammed the phone down on her." It was a negative experience just wanting to donate. I suppose that a post-communist country might even be suspicious of the very idea of charity: why would someone want to be charitable rather than just making money for themselves, right? "Yes, and I started to think why there were so many second hand stores in Prague and so few charity stores." That is an important point to make, isn't it? 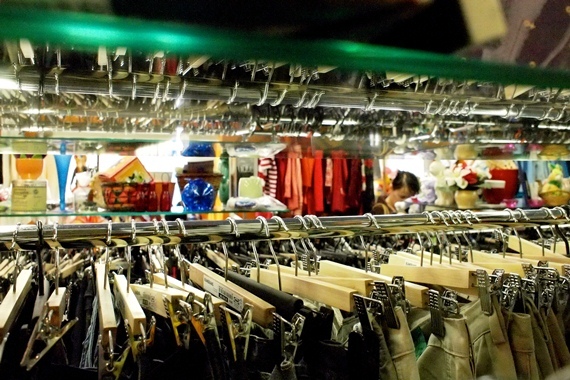 There are actually plenty of second hand stores in the country – known as "sekáče" where many Czechs go and purchase their clothes and so forth. But the difference with what I might be used to from England or you might be used to from the US, is that they are not charity oriented. It is purely a for-profit arrangement, right? "From my point of view, those 'sekáči' second hand stores, they are actually really charity stores too. I will explain why. Because they are actually buying their products from Western countries' charities. So they buy those items in bulk in places like London or Switzerland, they transport it here – which is not too cool from an environmental standpoint – and then they sell those products and make full profit out of it." So a person here doesn't donate their belongings to a "sekáč", right? There's no point. Or do they offer a person some money for their second hand clothes? 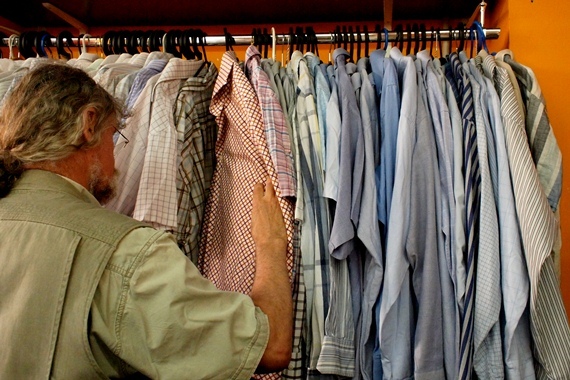 "You will find some places that take your clothes for a commission. And also those textile boxes are becoming quite popular. At the thrift store, we have to work a great deal to process the items that people have kindly donated to us. And this is expensive and very hard work. Whereas in the second hand stores, they buy it in bulk, and it is all already cleaned and sorted according to sizes and so forth. It is an easy setup. So if somebody is in the second hand business purely for money, they will probably choose the model that we just discussed." Tell me specifically about Prague Thrift Store. You have two stores, having started out with one, which is still running, in Vinohrady. And you recently opened up another store in Prague 7. "In fact, at the first stage, we started out with a very small store, 10-12 square metres. And that is how the whole dream started, basically, because my wife wanted so much to open up a thrift store. At the beginning, I wasn't even supporting her. I didn't believe in it; no Czech friends believed in it. They said that this model is not going to work. And it was the ex-pat community that ended up anchoring us so much. 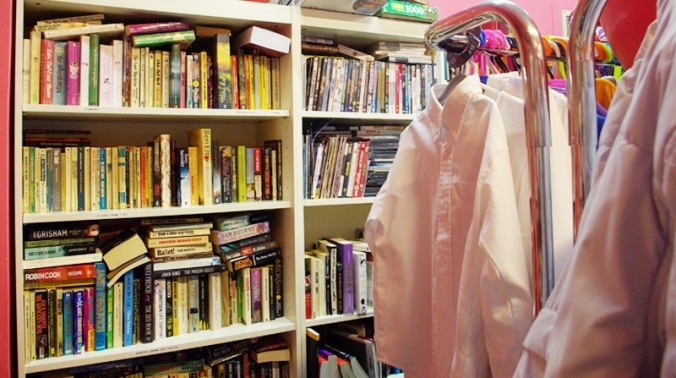 Because people are here for a short time, and a thrift store is very useful for such people. All these English teachers coming here for a year, and need a place where they can buy things very cheaply. 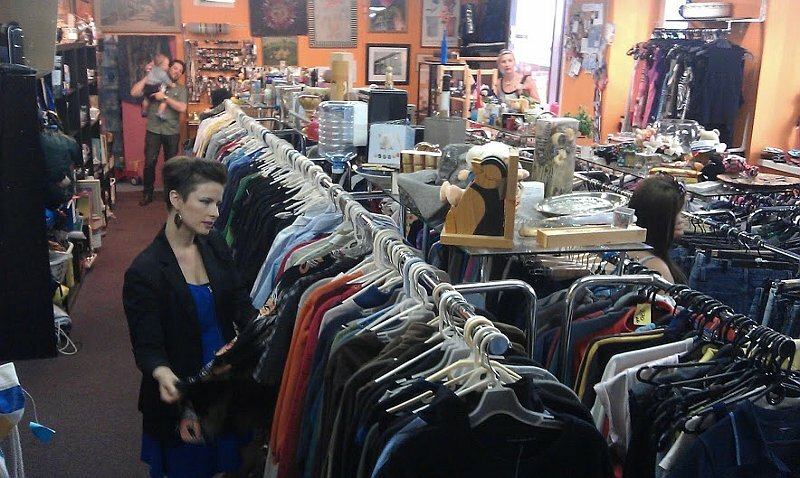 And they also don't mind donating their stuff when they leave, either, because this is their custom in their native country – using thrift stores in such a way." Would you say that your stores still mainly operate for ex-pats, as opposed to Czechs? Both people who come to donate and also people who are buying stuff from you? "No, I would say that it is a really good mix. And it is getting more popular among Czechs too. I think that Czechs have actually responded really well to this idea, because firstly Czech people like second hand stuff. They love their 'bazars' and those kinds of things. On the other hand, the environmental factor plays a role, and also the economic one, whereby people can get hold of quality second hand items at a low cost – and that is a big help. Not only that, but we are also trying to give people more support. For example, every Friday, we have our student day and senior day. On this day, these two groups can get these already cheap clothes at a 50 percent discount and other items with a 30 percent discount. So trying to enable access for people with lower incomes, and lowering the costs for them even more is something we also strive to accomplish." How do you persuade Czech people who aren't familiar with this particular concept to give your store anything? Because surely they might say 'Wait a minute. What is this? Why should we trust you? How do we know that the revenues will actually go to charity, and not into your own pockets? "First of all, we don't try to persuade anybody. This is a service for the community, and the community either uses it, or not. Today there are so many options as I said – they can use a textile box, which on the other hand is quite a pity, because most of those textile box items go to India and they make rags from it. Or they can give it to some other charity. For example, there is Sue Ryder out there, there is BETEL, I think the Red Cross has some outlets too. And yes, we quite often run into these questions: 'where is the money going?' 'what are you guys using it for?' and people are quite suspicious. To be honest, I actually appreciate that. People should be suspicious. People should take a close look at the organisation." "Quite often we get items that are not sellable, but they are fantastically reusable. And we redistribute these items among different organisations, for example Naděje, which is a homeless centre. We support them with manpower, clothes, blankets and shoes, whatever they need, especially in the winter time. We also have some mothers' shelters that we are also happy to support, whereby women who are coming from abused families end up having to stay at these shelters for a while. And after that, they have to start a new life in an apartment that is usually paid for by the state, and [without charity] such women basically have nothing for themselves and their one or two kids to begin a new life." Tell me how your thrift stores are organised. Are you registered as a charity? Is there a beneficial tax system that you can utilise? I know that in England, for example, charity stores don't have to pay rent, which is a huge advantage. And they also have volunteer staff. So how are you able to operate? "You bring up a very good point. Because people sometimes want to know whether it is a profitable business or not. And we did not start this as a business. We started this as my wife's hobby. And then when my company wanted to transfer me to Bahrain, and we found out that Barbara was pregnant with our second son, she asked me to help her with the thrift store. Which I did as a parental obligation. I love my wife and I wanted her to fulfil her dream. So basically we started this as a hobby and did not know in which direction it would go. Right now, we do not operate under the classic charity form. We are right now operating under the standard 'podnikatel' [business] format. But we do have plans to fix that and put that right, because it is not enough to just do the right things, you have to also do them in the right way." Tell us about some of the other charities that you support. You also hold an annual fashion show for the benefit of women's shelter charities, I understand. "We do hold an annual fashion show in cooperation with IWAP, the International Women's Association or Prague – by the way, I would strongly recommend any ex-pat ladies to look this up and join. So we hold this annual fashion show, which is a pure fund-raising event, and also serves to display how good a fashion show can look from second hand clothes. We will be holding this show again this year too. So please stay tuned for that." "With regards to the charities we support, I already mentioned some, such as Naděje, homeless centres...but what we are now starting to do is...I would like people to visit thriftshop.cz and there is a section there called 'Your Charity'. This is a new project, whereby we invite the community to first nominate charities that need support. Secondly, we will organise a vote and people will vote for the charity they think should really be supported. And then the third step is one day per month in one of the store locations, there will be a day when this particular charity that has won the vote thanks to community input will have the store for one full day. They will have all the revenue from that day. They will be able to represent themselves in that store, meet with people, talk about volunteering – volunteering is a big problem in Prague. It is very difficult to find volunteering options. So we will meet there, and this will occur on a monthly basis. So I really want people to start nominating their charities, which they want to be supported. Because we are a community service and a part of the community, and we want the community to be more involved and to help us."